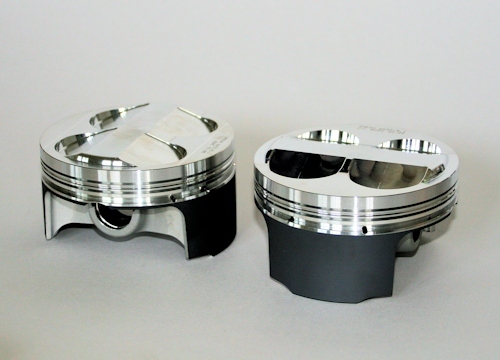 We thought we would give you a preview of our 904cc Sports Big Bore Kit pistons for the air cooled twins. They give a compression ratio of 12:1, have a tight quench, anti-friction coated skirts and have +2mm valve pockets. The big bore kit should be available in 6-8 weeks. Very nice! More details? Manufacturer? Will come with rings? Hypereutectic or forged? Eagerly awaiting these as Ted has 26K on the clock and will be itching to have his stock bores knocked out a little and bump the old displacement and CR up when I freshen him up. Mods: 16,000 linear feet of pipe wrap. Wetted daily for maximum oxidization. It's like I ride a fiberglass q-tip. The kit will be based on a core exchange of the barrels, we have a supply of bored and nikosil plated barrels which are also refinished externally, so will look new once fitted. The pistons come with steel nitrided rings. More info will be available in the coming weeks. speedfoos and sethb! like this. Last edited by PieMan; 04-06-2018 at 10:41 AM. Keep us up to date on these, been looking for a bore kit (with bbl). Pricing, included parts, etc. What mods do you need with the new pistons? Or can you just do these and achieve the power increase of the 80hp you stated? the TTP 904s Big Bore Kit is now available for purchase on our site. the 904s Big Bore comes as a kit and can be installed on any air cooled Triumph twin. We haven't quoted any power & torque figures yet as we haven't been on the dyno with the 904s kit, but they will be coming soon. Last edited by PieMan; 06-22-2018 at 04:47 AM. Goal placed on the piggy bank for this fall's rebuild project. Perfect! Can we get polished fins as per original Thruxton cylinder? Hi, I'm pretty sure that none of the cylinders on the Thruxton air cooled twins had polished edges, the cylinder heads all have polished fins. I believe the last couple of years of the Bonneville/America/Speedmaster had polished cylinder fins. We do have a couple of sets of America/Speedmaster cylinders with polished fins.